Does a merger between @AFTunion and the stronger @NEAToday make sense post-#Janus? The American Federation of Teachers held its biennial convention in Pittsburgh this month. Fresh off the Supreme Court ruling in Janus v. AFSCME that public unions can’t charge fees to non-members — a break from long-held practice that will cost labor millions in revenues and untold membership losses — conventioneers were defiant. “This is our moment. 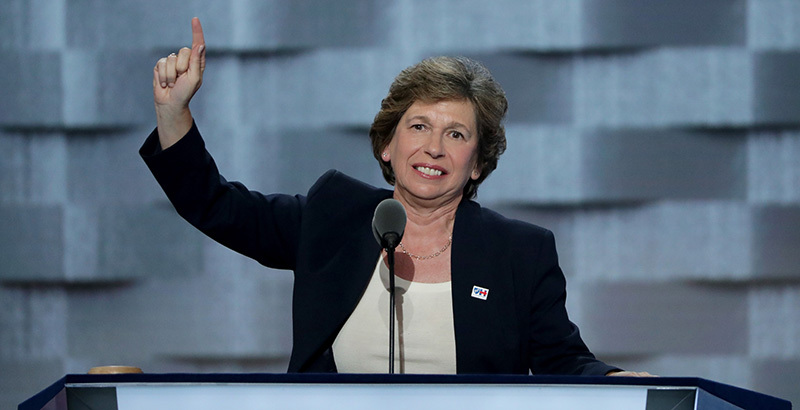 This is our movement,” said AFT President Randi Weingarten in her keynote address to delegates. She supported her optimism by announcing that membership levels were at an all-time high. AFT claims 1,755,015 members, with growth that has been uninterrupted even by the 2008 recession. But AFT’s membership numbers require a lot more scrutiny and interpretation than do those of the National Education Association. NEA has affiliates in all 50 states. Its smallest state affiliate, in Mississippi, has almost 4,800 working members. It does have some members in the private sector and in other professions, but even its non-teachers mostly work in the field of public education. AFT has affiliates in only 34 states. Only 21 have memberships larger than that of NEA’s Mississippi affiliate. Counting the AFT’s branch in the District of Columbia, a total of 22 affiliates are home to the overwhelming bulk of AFT members. Fifteen of those are in former agency fee states, making AFT a lot more vulnerable to the effects of Janus. AFT has maintained membership growth because it has no presence in most of the states where NEA has lost members over the past 10 years. In fact, more than one-third of AFT’s membership works in one state, New York. One of every six AFT members works in New York City. Six percent of AFT members are state and municipal government employees in fields unrelated to education. Seven percent are nurses and health professionals. Fifteen percent work in higher education. That leaves 72 percent who work in K-12 public education. Since, on average, there is one education support employee for every teacher in the U.S. public school system, it is very likely that K-12 public school teachers are a minority in AFT. By contrast, about 70 percent of NEA members are certified K-12 public school teachers. The composition of AFT’s membership is an important factor for the union’s future because reduced resources will force the union to prioritize its recruitment and retention efforts. NEA has a simpler task. Most of its members are K-12 public school teachers and most of its money comes from K-12 public school teachers. The only other group of appreciable size that it represents is education support employees. Even if NEA were to lose every support employee member, it could still carry on if its teacher numbers were stable. AFT can’t do that. Fewer than half of its members pay the full dues amount. Union recruiters will have to decide whether to concentrate on signing up large numbers of low-dues members to keep membership totals high, or a smaller number of full-dues members in order to keep revenues up. A post-Janus NEA will be essentially the same union, only smaller. A post-Janus AFT might disappear from even more states. It might end up with a higher percentage of teachers, or lower. It might seek to expand into different professions, or cull some of the ones it currently represents. All of that uncertainty leaves aside the question of AFT’s future relationship with NEA. In a world with shrinking membership, will there be renewed efforts at merger, or will competition revive the old NEA-AFT raiding wars? There are a lot of questions without any answers. Most of us are looking at this new era in labor relations as one of how unions interact with members versus non-members. But organized labor’s fate may depend on how unions interact with each other. AFT should feel the effects of Janus first, and worst. What happens after could herald a similar fate for other public employee unions.